One in five women will suffer some kind of sexual abuse while in college. This statistic, along with many others that display the dangers college women face are shocking and quite frankly, scare me half to death. Jill Campbell, the founder of the OnWatch™ app, shares many college women’s fears. Ten years ago, Campbell became a widow. With this tragedy came fear and a new feeling of vulnerability. Between working and traveling long distances to meet family and friends, Campbell began to create a list of things she needed to gain back her “feelings of security and independence.” Campbell wanted something to alarm and protect herself. As the smart phone came about and the age of the apps began, she assembled a team of professionals and turned her lists into her first app, WatchMe911™. WatchMe911™ was launched in September 2011 at a Women’s conference for the working woman. When Campbell became aware of the White House Apps Against Abuse Challenge she quickly focused on OnWatch™, an app geared towards college women. “We felt that the statistics for violence involving college-aged women were so staggering that the need was greater,” said Campbell. 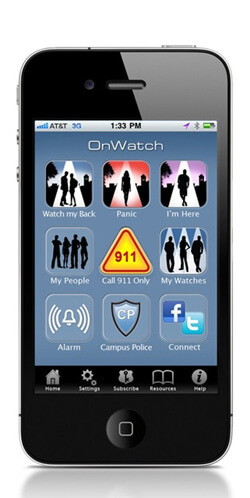 OnWatch™ is the college-level version of WatchMe911™. It has updated icons and added campus police and emergency friends. These two options allow you to easily alert local authorities and 3 selected friends by email and text with a prewritten message and your GPS location if you should ever feel unsafe or need help. My personal favorite option is WatchMyBack. Whether you’re going for a run, walking to your car from a late class or going on a first date, this option allows your friends to, literally, watch your back. You can set a timer for however long you want, and then when the timer goes off, you enter a password signaling that everything is okay and you are safe. If you do not enter your password, then an email and a text will be sent to your 3 selected friends with your GPS location and they will be able to help you. “With WatchMyBack, the friend or family member is only engaged if something goes wrong. Otherwise-none the wiser,” explained Campbell. Campbell and her team attended a meeting with Vice President Joe Biden on April 18, 2011 and officially launched OnWatch™ from the White House offices. “That was very rewarding. I never expected in my life to be a part of the dedicated group of men and women who work tirelessly and endlessly to prevent, protect, and restore the lives of so many victims of violence,” said Campbell. Since the April launch, the OnWatch™ team has been working with universities to spread the word and to get students using the app when they return to campus in the fall. The app is currently available on Apple™ products, and the Android™ version is being launched within the next ten days. “OnWatch™ can, if used, change the dynamics of a situation without escalating an incident. I am open to doing what it takes to getting this App for change into as many hands as possible,” said Campbell.